I have quite a few friends getting married and some have asked me what items I recommend putting on a registry. In the future I am going to start reviewing some of our wedding gifts. We received a lot of great gifts for our wedding. This will give me an excuse to use some of our favorite gifts and share them with everyone! This is the first of "Wyrill Wedding Wins!" Warning: These will be my own views on products and there will be a lot of purple. Let the purple begin! Jake has been begging me for days to make him some chili. I am not a fan of soup. Like I usually say, "I like to chew my meal, not drink it." Call me weird, but for the most part I only tolerate soup if a crazy amount of cheese is involved. In order to keep my status as Jake's best wife, I made chili to warm him up after his afternoon deer hunt. I decided again today to stay inside versus braving the cold. Instead of using my usual pan to make chili, I decided to try out my purple 2.75 quart dutch oven. Since it is smaller than the other pot, I figured this would keep me from making too much chili. I made the decision to use the dutch oven from start to finish. I have never used one before so it was a good learning experience. First I browned the hamburger. The instructions said to coat the bottom of the pan with oil and warm for about two minutes. I was concerned about the amount of liquid in the hamburger at first, so I added a little bit of water. The meat browned up nicely after warming up. After the meat was browned, I added a can of tomatoes and chili beans. 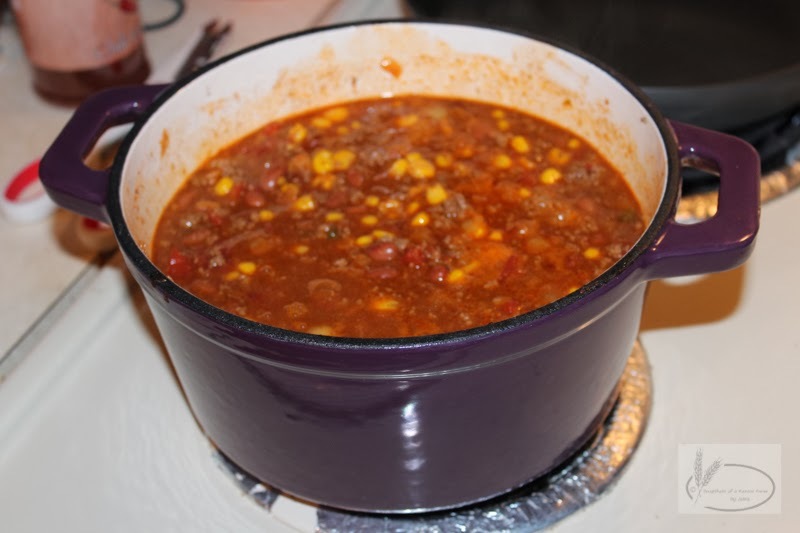 I also added Kroger recipe starters chopped onion, chili powder, and corn. Anyone who really knows Redbeard knows that the way to his heart is with cube steak (made it for lunch), corn, and potatoes. So corn in the chili and baked potatoes on the side. Here is the final product! Redbeard came by and approved of my surprise. He is excited to have a bowl of chili when he gets back from hunting. 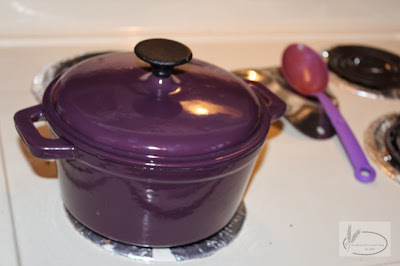 As for the dutch oven, I am impressed! When I make a meal that has ground beef in it I will use this again. 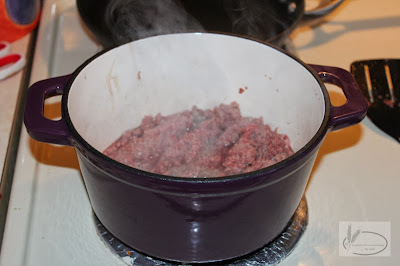 I am sure there are people that are going to say, "She has never used a dutch oven?" Yeah, I grew up on grilled cheese, cheeseburgers, and steak. What can I say? I am an extremely picky eater. Now I can say I have used a dutch oven!